Don't you wish you were just a little smarter? Ron and Marty Hale-Evans can help with a vast array of witty, practical techniques that tune your brain to peak performance. 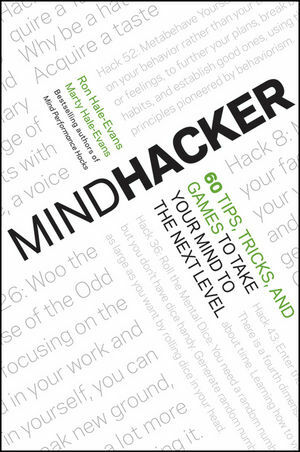 Founded in current research, Mindhacker features 60 tips, tricks, and games to develop your mental potential. This accessible compilation helps improve memory, accelerate learning, manage time, spark creativity, hone math and logic skills, communicate better, think more clearly, and keep your mind strong and flexible. Ron Hale-Evans is a writer, game designer, and the creator of the Mentat Wiki, a collaborative environment for exploring ways to become a better thinker. He has done technical writing for the Free Software Foundation, the Linux Foundation, and Microsoft. Marty Hale-Evans is a technical editor who has worked for Microsoft, Boeing, and the University of Chicago Press. An award-winning game designer, she currently chairs a local literary science fiction convention and pursues various creative endeavors.